As a young lawyer, I had the opportunity to listen to a District Court Judge admonishing another attorney about his argument to the Court. After a while, the judge ruled against his client telling him ”. . .there is nothing more expensive than a poorly drafted contract.” Not being a part of this case, I was left to simply await my turn to present my client’s Motion and then return to the office. However, in the years since, I had a number of opportunities to see this truism come back to haunt a number of people and companies. For example, I have had many clients who have to ask for help “after the fact”. After the contract was drafted (or not), and after the client has a dispute with another party. In the first example, our client had neglected to get an operating agreement in place. While this did prove problematic, the ill effects did not stop there. The other investor had free reign to take advantage of our client…and did. In the second example, we were contacted by a prospective client who complained that a former employee was taking his clients which caused a loss of income. Because there were no agreement in place, there was little that could be done except to draft an agreement with a paragraph designed to protect against such issues in the future. In the last example, a client called and wanted to draft an agreement to protect his 2% interest in a company. While we met, we also advised him of the need to draft some risk transfer clauses such as indemnity clause and to be included in the manufacturer’s insurance policy as an Additional Insured (this addition came at no cost to him). 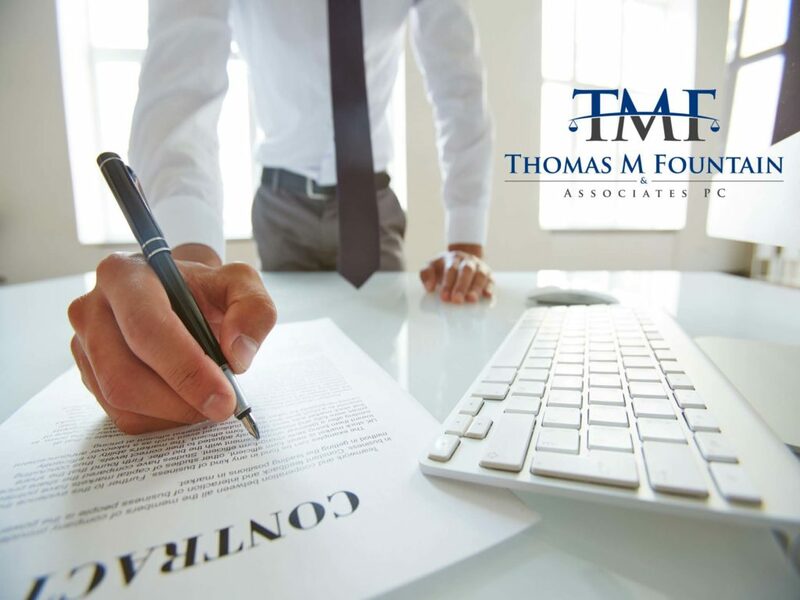 At Thomas M. Fountain & Associates, P.C., our goal is to not only help our clients out of these precarious situations, but to avoid them altogether. We work with each client one-on-one to draft contracts specifically tailored to their needs and protecting them from any possible loopholes which could be used against them. Taking these preparatory steps now can save your business endless time, money, and energy in the future. Call today to set up an appointment and discuss how we can help you with your contract needs. Como joven abogado, tuve la oportunidad de escuchar a un Juez del Tribunal de Distrito amonestando a otro abogado sobre su argumento ante el Tribunal. Después de un tiempo, el juez falló en contra de que su cliente le dijera “. . “No hay nada más caro que un contrato mal redactado”. Al no ser parte de este caso, me quedé esperando simplemente mi turno para presentar la moción de mi cliente y luego regresar a la oficina. Sin embargo, en los años posteriores, tuve una serie de oportunidades para ver cómo esta verdad se atormentaba y perseguía a muchas personas y empresas. Por ejemplo, he tenido muchos clientes que tienen que pedir ayuda “después del hecho”. Después de que el contrato fue redactado (o no), y después de que el cliente tenga una disputa con otra parte. En el primer ejemplo, nuestro cliente se había negado a obtener un acuerdo de operación vigente. Si bien esto resultó problemático, los efectos negativos no se detuvieron allí. El otro inversor tenía libertad para aprovecharse de nuestro cliente … y lo hizo. En el segundo ejemplo, un posible cliente nos contactó y se quejó de que un ex empleado estaba llevando a sus clientes, lo que causó una pérdida de ingresos. Debido a que no hubo acuerdo vigente, se pudo hacer poco, excepto redactar un acuerdo con un párrafo diseñado para proteger contra tales problemas en el futuro. En el último ejemplo, un cliente llamó y quiso redactar un acuerdo para proteger su participación del 2% en una empresa. Mientras nos reunimos, también le informamos de la necesidad de redactar algunas cláusulas de transferencia de riesgo, como la cláusula de indemnización, y de ser incluido en la póliza de seguro del fabricante como un Asegurado Adicional (esta adición no le costó nada). En la oficina Thomas M. Fountain & Associates, P.C., nuestro objetivo es no solo ayudar a nuestros clientes a salir de estas situaciones precarias, sino también evitarlas por completo. Trabajamos con cada cliente de forma personalizada para redactar contratos específicamente adaptados a sus necesidades y protegiéndolos de cualquier posible escapatoria que pueda usarse contra ellos. Tomar estos pasos preparatorios ahora puede ahorrarle a su negocio tiempo, dinero y energía infinitos en el futuro.